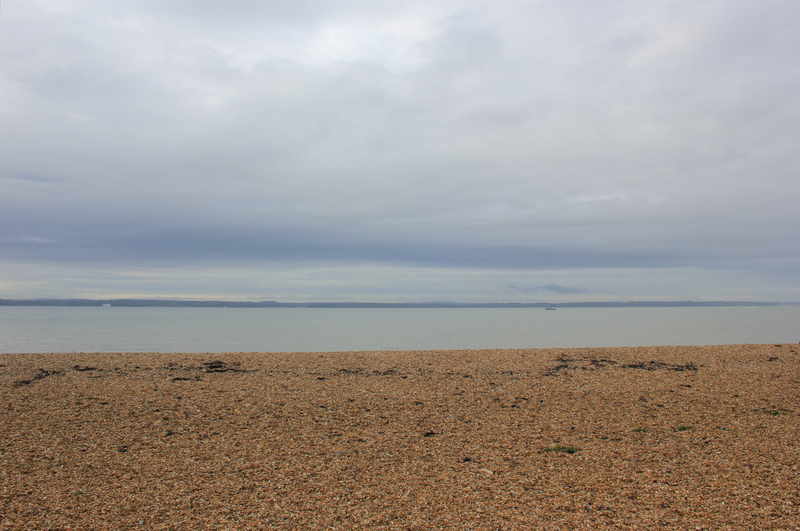 As we walked northwest along the shores of Stokes Bay we came across a memorial. 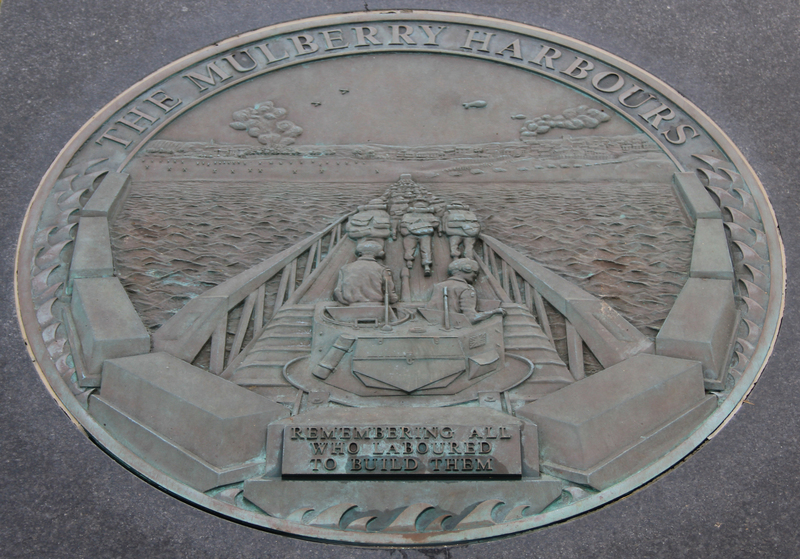 It remembered the men who had built sections of the Mulberry Harbours during World War Two, the great concrete structures that were floated across the English Channel to support the D-Day Landings. Fourteen of the caissons were constructed at Stokes Bay during the course of 6 months, worked on by some 1,400 men. These men had no idea what they were building; they were not told for security reasons. The casissons were type B2 “Phoenix” units, partially submerged sections that were towed over to France by tugs and then sunk to form breakwaters to protect the floating roadways and pierheads. The first of the caissons to be completed at Stokes Bay toppled over as it was being launched, killing three workers and trapping another 15 underneath it. This disaster was caused by seaweed and shingle on the slipway. It delayed production by a month, but after this the slipways were cleaned and all further launches went without incident. The caissons were constructed at two sites along Stokes Bay and the memorial sits in front of the western site. Behind the memorial a series of parallel lines can still be seen in the ground, marking the construction site (at the end of this post are co-ordinates for the memorial which can be copied and pasted into Google Earth. The parallel lines in the ground behind are clearly visible). The etching on the memorial depicts what awaited the men who crossed over to France. It presents what must have been an incredibly daunting perspective, I think. 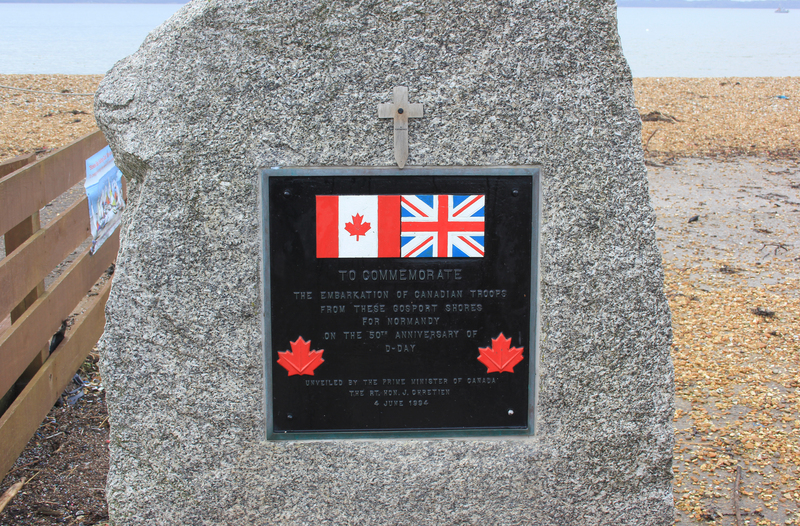 A little further along the shoreline is the Canadian Memorial, remembering Canadian troops who departed from this section of coast on 4 June 1944, two days prior to D-Day. The nearby sailing club was used as an embarkation Loading Control Centre. Just beyond the Canadian Memorial we found a third commemorative plaque, but this time on a lighter note altogether. This section of coastline was voted one of the UK’s Top Ten Lunch Spots. I am not joking – here is the proof! Why was this one of the country’s top lunch spots, I wondered? Was it the view? I held my breath and turned around to take in the seaward vista that awaited me. Hmmm. Maybe, on a sunny day… Or maybe it’s nothing to do with the view. Maybe there’s something in the air that makes your cheese and pickle sandwiches taste better from this spot (although personally if there is pickle anywhere near my sandwiches I generally consider them to be beyond redemption). Whatever it was that made this one of the UK’s Top 10 Lunch Spots we decided not to stop and find out. We headed on, leaving the bench for some other lucky soul to eat their sandwiches on. 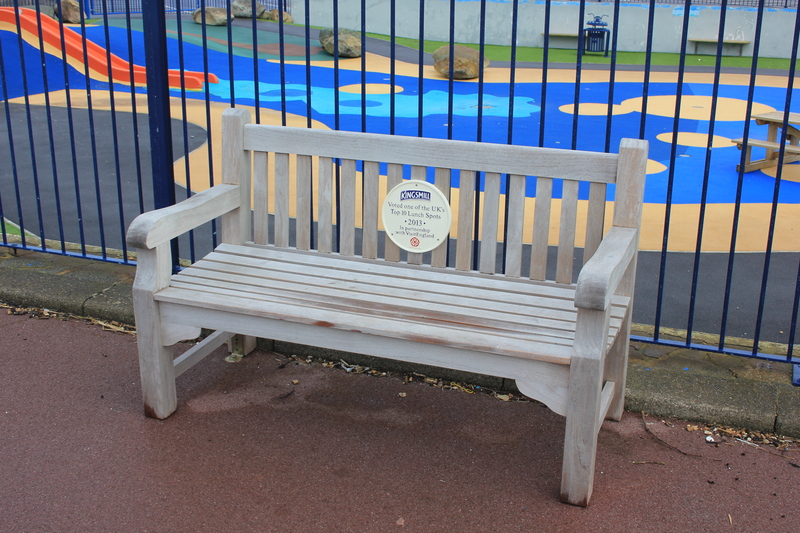 This entry was posted in Hampshire and tagged coast, D-Day, Gosport, Hampshire, lunch, memorial, Mulberry Harbours, Stokes Bay, travel, walking. Bookmark the permalink. Nope – I’m still not with you on this!